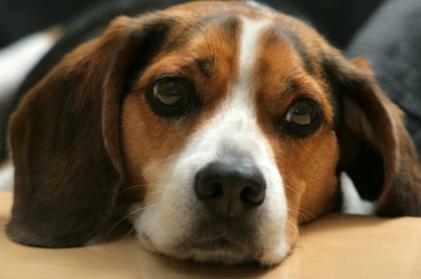 Hi, I've just adopted a three-year-old male Beagle and he is wonderful. However, I think he has a fear of pottying in front of me. He urinates just fine outside, but as soon as we come back in the house he plays for a little while, and then poops the minute he's out of my sight. I've tried catching him in the act, but he doesn't seem to understand what I am displeased about. I am a veterinary technician, and I've taken behavior classes in the past, but I've never actually had a pet that I really had to house train. Would perhaps getting a tie-out and letting him do his business outside without me be a good idea? I live on a farm, so I don't want him wandering off. Just confused why he won't go #2 in my presence outside. I have to be honest, I'm not a big fan of tying dogs on a line. I've known of a couple that have become caught up in the line. I'd actually recommend purchasing a small outdoor dog kennel. Many building supply stores carry them, and you don't need to worry about flooring, etc. because your dog isn't going to live outside. All you really need is the sufficiently high chain link fencing to create a secure enclosure for your dog. If your dog is truly shy about pooping in front of you, this should take care of the problem. At any rate, it will make it easier for you to leave him outside longer, and hopefully this will give him enough time to take care of all of his business.